International business exchanges between and with Asian countries have increased enormously over the last few years. As a natural consequence, this has brought about an increasing number of trade disputes that are being resolved through arbitration as an effective alternative to more expensive litigation. 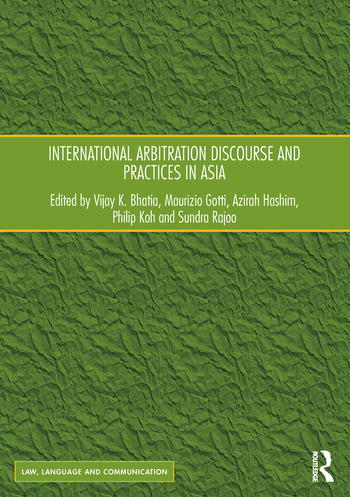 This volume offers a variety of perspectives on this important international dispute resolution practice in Asia. Essentially interdisciplinary in approach, it brings together specialists in law, international commercial arbitration and discourse analysis. The contributing authors include practitioners as well as academics. Together they explore the interrelations between discourses and practices in the field of arbitration in Asia. The work also investigates the extent to which the ‘integrity’ of arbitration principles, typical of international commercial arbitration practice, is maintained in various Asian contexts. The authors focus particularly on arbitration norms and practices as they are influenced by local juridical, cultural and linguistic factors. The book will be a valuable resource for academics and practitioners working in the areas of arbitration and dispute resolution, as well as researchers with an interest in language, communication and discourse analysis. Maurizio Gotti is Professor of English Language and Translation and Head of the Department of Foreign Languages, Literatures and Cultures at the University of Bergamo, Italy. He is also the founder and Director of CERLIS, the research centre on specialized languages based at the University of Bergamo. His main research areas are the features and origins of specialized discourse, both in a synchronic and diachronic perspective. He is also interested in English syntax and English lexicology and lexicography, with particular regard to specialized terminology and canting. He is a member of the Editorial Board of a number of national and international journals. Azirah Hashim is a Professor in the English Language Department, Faculty of Languages and Linguistics and currently, Director of the Centre for ASEAN Regionalism (CARUM) and Executive Director at the Asia-Europe Institute (AEI), University of Malaya. Her research interests include Language Contact in the Region, English as a Lingua Franca in ASEAN, Language and Law, and Academic and Professional Discourse. Philip Koh has over 30 years of expertise in three arenas: the academic, the professional and industry. His specialisations include contract and investment laws, financial services and securities, corporate law and governance, commercial and civil litigation and public law. He is a member of the Financial Stability Executive Committee of Bank Negara Malaysia, Private Sector Group Global Corporate Governance Forum, Board member of Minority Shareholder Watchdog Group, and has previously held the posts of Adjunct Professor at Deakin University and visiting Fulbright Scholar attached to the Harvard University Economics Department. He is senior counsel at High Court, Court of Appeal and Federal Court cases involving commercial and civil disputes and a panel arbitrator of the Kuala Lumpur Regional Center for Arbitration and has sat and written awards as Arbitrator. Datuk Professor Sundra Rajoo is the Director of the Kuala Lumpur Regional Centre for Arbitration (KLRCA) and current President of the Chartered Institute of Arbitrators (CIArb) Global. He was Founding President of the Society of Construction Law, Malaysia and the Past President of the Asia Pacific Regional Arbitration Grouping (APRAG), which is a federation of nearly 40 arbitral institutions in the Asia Pacific region. He serves on the panel of numerous international arbitral institutions and organisations. He is a visiting professor at the University of Technology Malaysia and the National University of Malaysia. He is the author of a number of books on arbitration and contract law.